A new year means another 12 months of endless possibilities. So go ahead — it’s time . . . Break the binding on your brand-new calendar. 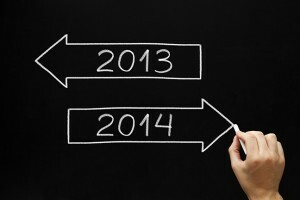 Allow 2014 to be the year of trying new things, boosting sales, and taking your business to the next level. And let the POWER of PRINT take you there! Here are 8 smart ways to use print in the new year . . .
1. Make business resolutions. Have you ever made a New Year’s resolution to drop those extra ten pounds or promise yourself you’ll buy a whole new wardrobe? The same resolutions should be applied to your print marketing! First, trim down your “fatty content.” This is the content that no longer compliments your company’s goals and objectives — especially if you’re creating new goals and objectives for the New Year. This is also a great opportunity to give your business cards and brochures a “wardrobe makeover.” There are plenty of unique print techniques that can take your personal branding from DRAB to FAB in 2014. 2. Take risks. Is print marketing a foreign concept to your business? Well, 2014 is the year to jump into the print marketing pool! For a small business seeking to maximize its ROI for advertising, print advertising outdoes both television and Internet advertising. It’s time to start thinking out-of-the-box and embrace more advertising channels. You’ll be shocked by the positive impact that a well-done print piece can have on your brand for your clients. 3. Involve your customers. We have all made this mistake — sitting in a boardroom table with notepads and giant cups of coffee discussing, and ultimately assuming, what your clients want to read about. Would you like to know the deep, dark secret of getting into your clients’ minds? Brace yourself . . . this is big. All you need to do is to pick up the phone or call them into a meeting, and ASK THEM: What do you want to see more of? What are your pain-points? What can WE do to further your understanding of what we can do for you or your business? The best way to get information is directly from the source. So why deliver this information via print? Print provides clients with a tangible takeaway that they can keep FOREVER; print will not get lost in an overflowing inbox; your readers can avoid pop-ups and unwanted ads; and they won’t have to sift through millions of search engine results to find the answers and solutions they seek. 4. Get creative with direct mail. Years ago, Heritage Printing sent out a direct mail piece that was called the “De-Stressification Kit.” The whole piece revolved around a paddle ball game, so clients could literally “Sit back, kick their feet up, and paddle away their anxiety while learning more about how Heritage could help turn their workplace into a happy place. And give their biggest worries ‘the bounce’.” The piece included clever, informative, and relative content, and was a HUGE SUCCESS! Gather your creative team, and brainstorm a list of direct mail pieces for 2014. It truly is the best way to STAND OUT in our noisy, digital world. 5. Understand the importance of longevity. Compared to websites or national newspapers, magazines have the longest lifespan. There are magazines that have been treasured for decades. National Geographic, Vogue, Good Housekeeping, and Cosmopolitan are examples of magazines that have won over the hearts of loyal readers for years. Share your content in a popular niche magazine (or create your own). Your clients will order and place magazines and print publications in their waiting rooms for many eyes to see. They will not put out computers for people to search through online eNewsletters (and even if they did, readers likely wouldn’t be searching for your content amid all the other options). Tangibility is powerful! 6. Pick your target, aim, and fire! One of the best things about print and direct mail is that you can target a specific audience and be practically guaranteed to reach them. Think of it this way . . . It’s time to send out your Holiday letters. You finally finished writing out the detailed summary of your accomplishments and milestones from 2013 and are ready to get them out. Would you upload the letter to a random place on the Internet in the hopes that your friends and family would miraculously stumble upon it? No, that would be foolish! You put your message in a fancy envelope and address each one to EXACTLY whom you want to read it. The same should apply for your business messages: Use print marketing to reach the people who WANT to read your content; don’t risk placing it on the Internet, and then just hoping the right people find it. Decide who your target audiences are for 2014, and gear your content and advertising towards them. 7. Nurture your clients with printed pieces. 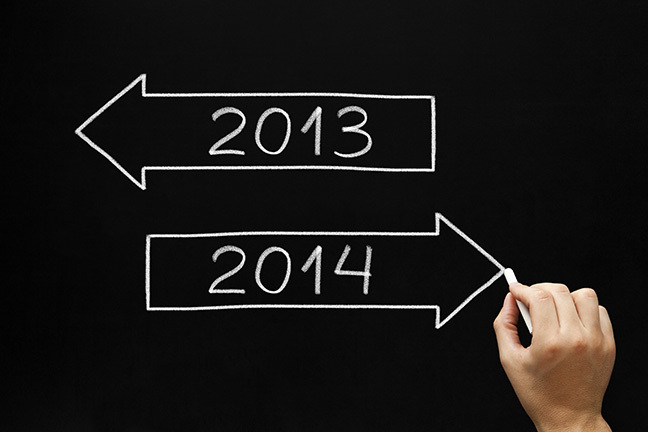 Throughout 2013, there’s been a lot of talk about retention and nurturing clients. This will be a big trend to look for in the New Year. Nurturing clients can include email campaigns, relevant blog posts, newsletters, and many other components. But don’t forget the impact of print during your nurture campaigns! 8. Keep an eye on the trends. Similar to the digital world, print technology and techniques are also changing. Take 3D printing, for example . . . Doctors, architects, artists, and even fashion moguls have become fascinated by this new technology (learn more in “Understanding the Basics of 3D Printing“). Victoria Secret even incorporated 3D print into their 2013 VS Fashion Show. Be one step ahead of your competition, and always be looking for the next BIG Thing. Now, I’m not saying that print marketing is an all-or-nothing deal or that you should shift all your marketing efforts to print in 2014. BUT the most important thing to remember is that print readers are usually very loyal readers, and loyalty is VERY powerful. It costs 5x more to acquire a new customer than it does to generate new business from an existing customer. People who read magazines or newspapers do so regularly. This reader loyalty, combined with high retention rates and creative possibilities, makes adding print to your marketing plan a no-brainer. Make 2014 the best year yet — and don’t just TWEET about it, PRINT about it!